That’s the statement written on the website for the Coconino National Forest. Ken, a fellow camper here at Willard Springs, Arizona, dispersed camping area, alerts me to the new rules that went into effect May 1st. “What?” I respond with surprise. “Doesn’t matter, ” Ken continues. “Doesn’t matter,” Ken says again, with finality. “You’re supposed to find it on the internet or get one of their maps.” Ken sees this as just another way people are hassled. Of course, as soon as Ken leaves, I get online. I find an article dated April 30, 2012, at www.azdailysun.com. “Restrictions on where drivers can and cannot legally travel on the Coconino National Forest begin tomorrow, as part of a national directive to limit off-road driving. Driving across the forest at large will become illegal, and the forest will be closing a little more than half of its roads – mainly lesser-used routes heading to similar destinations . . . . Car camping is allowed within 30 feet of roads in most of the forest, and within 300 feet in designated areas along another 300 miles of roads. I don’t think I’m “car camping.” Or is this a term used to differentiate it from “tent camping?” I’m going to have to do more research. I’ve mulled this over and searched the National Forest website. At this point I’ve decided to stay in this campsite. If a ranger pays me a visit, I’ll beg to be grandfathered in. One of a few campsites within 300 ft. of the road. Of course, I have to leave by next Tuesday, May 8th, anyway. That will be the end of the fourteen days permitted for a camp in the National Forest. Geesh. The simple life isn’t always so simple. 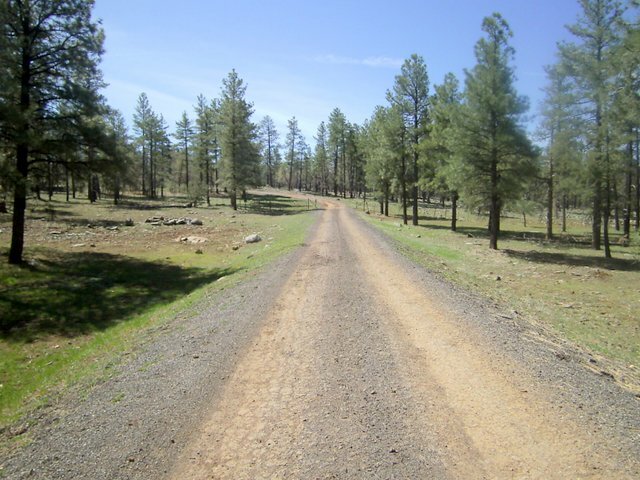 This entry was posted in Simple living and tagged 14-day limit, Arizona, Coconino National Forest, dispersed camping, OHV, rules, RVing, Willard Springs. Bookmark the permalink. 104 Responses to Is our campsite illegal? IT’S NOW BEGINING… THE TAKE OVER OF THE UNITED STATES OF AMERICA.. I JUST RECEIVED AN EMAIL FROM A NURSE IN TENNESSEE WHO SAID SHE WAS ON A GROUP THAT DENIED AN 86 YEAR-OLD A DIALYSIS TREATMENT FOR BEING OVER 75 YEARS OLD!!! Snopes supports everything Obama says and denies anything anti-Obama!!! Let’s let the argument rest as it is a he said she said, okay!! I’m sick of it!! Just call your local medical center/ hospital and talk to them. I called Tucson Medical Ctr. and they knew all about this bogus message on the web and get several calls a week about it. They say it all made up there is no such program. People hurt their positions with false statements. Emails go viral without being verified. I’m not a fan of President Obama by any means, but facts are facts and I don’t make up my own. It’s not necessary, and only waters down your position, Butterbean. Thank you thatcase. Is this THE Butterbean? I’ve missed you! Yes this is the butterbean and you can ‘block’ me if you want, but I am sick of the way we are losing everything that belongs to the people of America!! When we can’t get medically treated because we’re over 75 years old, I’m 76, then it’s all over.. Enjoy camping while you can.. My days are over!! I’m not going to ‘block’ you . . . unless you get REALLY, REALLY, REALLY rowdy. This is a topic that gets your dander up . .. We all have those topics! I would just stay put until a ranger approaches you and tells you that you are parked illegally. Chances are nobody will even say anything at all. Hope you don’t have to move. That’s what I figure. A ranger drove down the road yesterday but he didn’t stop. If I’m told to move, of course, I will. What sort of crazy new rule is that? Just so they can keep better tabs on who’s camping in dispersed areas? Stinks, if you ask me. Reading the history of these new rules, a lot of it was initiated because of the damage being done by irresponsible OHV (off-highway vehicle) riders. Then, of course, everybody who drives a motorized vehicle is lumped together. I see the damage and I understand the need to control it somehow. Instead of going around a curve in a road, they grind across fresh ground in a shortcut, tearing up little oak trees, smashing flowers, making ruts for erosion . . . So everybody pays the price. Yes, sadly, a lot of OHV riders are irresponsible. The damage and the noise are aggravating. There are some who seem to delight in ripping up the earth, thereby giving them all a bad name. Have you seen a ranger since you’ve been there? I bet he/she would be a little confused by what was written. I can understand limiting the off road vehicles running around and tearing up the pastures, forests, erc. I haven’t seen a ranger. Ken saw one drive past on the road. I think better public education is needed. People passing through (something I do and will do often) cannot be expected to find the NF office on a weekday and get a map before finding a place to camp for the night. Put up signs or something. It may be a rule/law they’ve put in place that allows them the right to refuse use of land to those who are abusing it–sort of like a search warrant. With a rule in place, they have a law/rule behind them to ask anyone who is abusing the land to leave. That would be my guess. I would stay put. I bet no one comes along and if they do, how are you supposed to have known the new rules? Dang, rules, boundaries,and such……making life harder to enjoy. If everyone would respect our forests, and I mean everyone, including boondockers and campers, would not leave trash, human waste, dog waste, garbage, chopped trees, and ruts across meadows, maybe we wouldn’t be saddled with so many restrictions. It is a shame. Yup.. pack it in, pack it out! Where we were camping last weekend, an ATV came flying through, ripping through the campground and out again. When we were walking later there was a soda bottle and a can of beer laying in the road. Weren’t there during our morning walk. Of course we picked them up and hauled them home with us in our own garbage. sigh. Our ATV group has riden together since 2000 and adopted that slogan then. Not all of us atv riders are squid’s!!! You will find that the majority of the damage from atv are the smaller sport quads riden by the younger dunner crowd. Most of us “old farts” have more respect (not saying all do)…always one bad apple. If I remember correctly…forestry will not be going from camp to camp but will be out in force at the major areas handing out info on the new rules, closer to Memorial day. I favor the stay put vote! The words ARE confusing and I doubt even the rangers understand them! I imagine a few of your neighbors have already gone over the 14 day limit, but over the 300 ft. one, too! The man who has an outstanding fine of $275 for staying too long somewhere else, left here this morning. I’m going to be sure to leave after 14 days, too. What kind of ‘notice’ have you got since you got there? Are you sure ‘they’ know what day you arrived ? Unless they have spoke to you they don’t really know,most rangers do not have a problem staying a bit over the 14 days AS long as you DO NOT look like you are squatting. There are areas that they do patrole more because of this problem. It may be a cost thing. If everyone camping is in view of the road, the rangers have less territory to cover; therefore fewer rangers needed, less gas needed, etc. I don’t know how they will enforce the 300 ft. law, but making a few examples out of one or two in an area will probably clear out quite a few of the others. First, you’d have to know if there is a stiff fine or jail attached to breaking the law/rule. Easier to enforce, yes but I think they may be looking for drug smugglers/illegals after last years huge fires. JMHO….. Interesting, the solution of only parking 300 ft from roads really doesn’t address the ORV tearing up the landscape or littering. Sounds like the rules were set so that they are enforceable rather than eliminate the problem. Desiring the simple life certain gets complicated!!! I can certainly see that a person might feel like they just hung out the “You are not welcome sign” It’s a sad state of affairs. You make good points. Maybe “they” (NF service) feel they can’t distinguish between roads made by campers on their way to their campsite and OHVers on the way to h#*l and back. It’s a problem and a “sad state” any way you look at it. Anyway, here is a link to a thread in a forum on the Escapees’ site from last August concerning this change in the rules etc..
My advice is to get within 300 feet of a designated dispersed camping road or out of the forest. Well, Gary. .. I went to the forum and read as much as I could stand. That’s pretty scary. Now you’ve got me thinking I need to break camp and move, first thing in the morning. Thanks for alerting me and for the link. I came across “squatters” in a national forest in NM. It isn’t a pretty sight, and in my opinion they were causing permanent damage to the land. Nails in trees, beer bottles, cigarette butts (fire danger). It is a shame that a few make it difficult for the many who respect the land and follow the law. People are people whether they are camping or not. Some are slobs, some are not. I’ve paid for state campgrounds where I had to spend an hour upon arrival cleaning up the site. I don’t imagine they live any differently when they return to their neighborhoods. I’m like the others Sue. I would feign ignorance. I would do so politely. I can not recall that you were given a camping permit. If not, how would the Rangers know for certain how long you have been camping? As long as there is room, why in the world does it matter how long you camp in one place? Rules are rules . . . The rangers sometimes will write down your license plate number and the date so they can keep track of how long you stay. You might not even know they’ve been by your campsite. You have to move so the forests don’t turn into a collection of squattervilles . . . you know, old cars, couches, chickens, wringer washers, etc. This is new territory for me! I am not a RVer. I read the above mentioned Escape thread. I have been educated. Me, too, Llanos! It’s kind of intimidating. Wait … no chickens? Okay, packing it in. And don’t forget to take the goats with you when you go. Read online of the current threat some are making to start forest fires…wonder if the 300 ft. rule is influenced by this? But as others have said…rules are being made in most every part of life. For whatever reasons. And it does not bode well for any of us. If only those who break rules could understandwhat they are doing to us all, themselves included. Thanks for sharing this. All things must be considered for future decisions. Sometimes I’ll stray from my usual “and the crew did this and that and I washed dishes” type entries because these issues are important to hear about and discuss. You’re right. . . “all things must be considered” . . . It is not only Coconino National Forest, but all National Forests and the new rules are going to confuse and anger people.. I was up in South Dakota last summer and the N.F. there had already implemented their plan on motorized vehicles. I got the map and some clever person had made sure that the places one was allowed to camp were not accessible to RVs. I did find a spot a lovely spot but it was to close to the road and traffic. Later moved to another spot that was more off the roadway. The maps were very confusing and the roads are not well marked. I am not sure why the Forrest Service is being so restrictive to RV’rs, there is no public explanation provided that I could find. I appreciate you weighing in on this topic, Julia. Apparently it is not only this NF district. I agree, the maps are very confusing. I opened the PDF file on the NF site for Coconino and you’d have to be acutely familiar with the area to find the road you’re on. And what about all these beautiful, established campsites that are more than 300 ft. from the road . . . like the one I’m in now. I’ve heard this camping area gets crowded in the summer. These new rules eliminate most — and that’s a big most — of the campsites here at Willard Springs. I’m nervous about it because there are no signs or markers to help a person abide by the new rules, and, like you said, the maps are nearly impossible to figure out. Oh dear, this sounds like a real mess. Perhaps started as you said Sue by a desire to control the truly inconsiderate. And I’m all for that. I don’t think ATVs etc should be allowed to desecrate the landscape. But how to control that without eliminating harmless use of our forests. If corporations and businesses including ranching can use public lands then people who do no damange certainly should be able to as well. I’ll be glued to the screen waiting to see the next episode..
I’ll try to follow the rules and hope I’m treated right. Can’t do any better than that, right, Sherry? Tomorrow I’ll move out of this campsite. Maybe that is what they want. No free camping, more money for the government. more gov’t control……could be good after the fire in AZ started by drug smuggler/illegals….could be bad, ….why does Homeland Security need 16,000,000 .40 cal ammo?????? I cannot believe the feds are making it harder for people who play by the rules to enjoy public land. I can, the United Communist State of Mexifornio has been pulling stuff like this for years.Wanna keep campers out, bulldoze the road closed. EPA is the one behind these laws being passed and enforced in NF. Ranchers being driven off BLM leasing they’ve had for years and generations. Do you know the differance between a developer and a Sierra Club member????? A developer wants to build a home in the forest……the Sierra Club member already has one…. Sue, I thought that the 14 day stay was at a single campsite, are you saying it’s for the whole forest? I thought the same thing as you Ed. I read somewhere (NF site?) and heard from two other campers that it’s the whole forest. The campers rotate from Prescott NF to Coconino NF to Kaibab NF and back again. Yes, it’s trickier than the old “which cup has the pea under it” game. Rusty (Three Feathers, the mountain man) told me that Utah is more lax. He’s gone up there and after 14 days, if he crossed the road to another site, the rangers were fine with it. Of course, that may all be changed now. Not that I’d want to be within 300 feet of a road, but I can understand why. This will certainly reduce some impact on the forest but also maybe keep a careless (not you) camper from starting the forest on fire far from the road. Have you seen a Forest Ranger? Remember that’s 13 days from when they find you. I’ve driven away from my campsite a few times. A ranger could have come by then. They do drive through the area. A ranger could take a digital, dated photo of each rig as they drive by. I can’t risk it when $275 fines are being handed out! Sue, come on up to Utah. I’ve been camping here all my life and the only BLM ranger I ever had come and talk to me was trying to be sure I was OK (it was winter and I was holed up in my Casita, waiting for dog meds to arrive in the mail). There aren’t enough rangers here to enforce much of anything, which is good and bad. There’s so much cool backcountry that you could camp all year in the same spot and not be noticed, as long as it wasn’t a real obvious place. I think I read somewhere that there are approx. 52 million off-road vehicles in this country. Even if less than 1% are destructive, that’s a lot of ripped up land. As usual, it’s the minority that causes rules affecting everyone. I’m crossing my fingers hoping my packages arrive in the mail by Monday when I have to leave the area. In my book, no coffee is too strong or too bitter if served by a friend. Iffen that thar Arbuckles don’t float a horseshoe, it ain’t done….. The Forest Service has been working on these changes for a few years and it is done on a Forest by Forest basis. The Forests that are close to a major population center are more restrictive than remote ones. Also, few forests are as physically open as those in Arizona. In the Sierras, most places you can barely WALK 300 feet off the road much less drive 300 feet off the road. Plus with the huge population center in the heat of Phoenix means Arizona will be one of the most restricted and enforced in the country. There is an easy solution to that, in another month you leave and go up into Utah or Colorado where you will probably never see a Ranger. I assume car camping means using a vehicle as opposed to walking in. In other words, you leave your car close to the road and then walk in further beyond the 300 feet and set up your tent camp. It doesn’t matter which vehicle you are in. In the last 4 years I have been full-timing on public land, and I’ve seen so much damage done by the 4X4 rigs going ever deeper into the forest and desert, I am in favor of the changes. I certainly don’t think it is an infringement of our rights or freedoms. The job of the Forest Service is to maintain the health and usefullness of the Forests for future generations–A job they have done extremely well! If that means putting restrictions on a very few for the good of the very many, I’m okay with that. After all it is PUBLIC land, the needs of each user group has to restricted for the greater needs of the whole. As an RVer I want to be able to disperse camp. As a hiker I want to be able to walk without 4x4s zooming by everywhere. If I had an ATV I want a place set aside I can go ride. On and on it goes, every user group wants the whole forest and they SIMPLY CAN’T HAVE IT! Bob, you say wait another month to come up to Utah and Colorado – yes, for Colorado, no for Utah, unless you want to be in the high country. The desert is already heating up. And I will add that Colorado is starting to get more restrictive, depending on where you are, anyway. I, too, have heard that about Artizona being very restricitve, more so than many places out West. For fewest retrictions, try Nevada, Wyoming, Montana, and Utah. Bill . . . The easy way to get to my blog is to type the word rvsue either in the search box (Google, Bing, whatever) or the URL address line. You don’t type hotmail.com as that has nothing to do with my blog. Once you’ve typed rvsue, my blog will pop up at several places at the top of a list. Click on one to get to my blog. Once you’ve navigated your way to the present day, add my blog to your Favorites list. Then all you have to do from then on is click on my name in the Favorites list. I realize you probably know all this. I’m spelling it out for anyone who’s accessing my blog in a roundabout way . .. and I can tell from my admin. page that some readers are. So thanks for bringing it up. Hi Sue!!! Hope you have a fabulous weekend wherever you are!! Thank you, Teri! What a breath of fresh air you are today. You have a fab weekend, too! Sue is not within the 300′ max distance of an approved dispersed camping road. Sue is also a full timer living in her RV which can be determined as her residing in a NF which is not allowed. Pretending to be ignorant of the regs/rules or actually being uninformed, is not an excuse, pretending is lying and usually a ranger will pick up on most lies quite quickly and not appreciate the dishonesty.. These changes are/were done by the executive branch, not congress. IMO the changes are based in politics and are nothing more than payback to certain groups for voting correctly in the last election. And I’ve found that in general the local Flagstaff area is not all that RV friendly. In total agreement with you, Gary. This will be enforced more in AZ as AZ NOT cooperating with the influx of illegals. Over the last 6.5 years we have boondocked a lot and I’ve never seen anyone in an RV looking anything like an illegal. From our experience, Flagstaff is the only area in AZ that is not RV friendly. Well there is that small anti RV segment in Quartzsite too. We should note that as yet, and they have had 3.5+ years, there haven’t been any RV/camping changes in BLM regs/rules; only in the national forests that certain back packing tenting type environmentalists’ call home. I like to think I’m enjoying a vacation trip to this National Forest. If I were living here, I’d be down at the Garden Center picking up plants for my garden! Hey Sue, the weather up here in Zion is wonderful, sunny, breezy (not windy), cool just amazing! Our RV park is 90% full this wwekend with huge sunblocking, diesel pushing, million dollar babies! We are certainly the poor kids on the block! 🙁 Chuck and I will go today and check out a few of the public lands roads and see if we can find something that you might like… and maybe Chinle too! That’s really nice of you to do that, Geri. (You, too, Chuck) I’m sure to be up that way before May is over. just sent you an email with pictures! seems most of the BLM land around here has deeply rutted roads…. we were in 4WD!!! But found one place…. Chinle might know of more! Okay. I’ll check my mail. Thanks. Put more restrictions on dirt bikes and ATVs. If people like the noise that these things make and the speed which they travel at, go to a designated race track in town. Makes the laws more specific to target the real problem and leave the quiet campers alone who just want some peace and quiet in natural surroundings so they can hike, bike, fish and swim. I understand your frustration and annoyance. One thing I’ve noticed — I may be wrong about this — the ATVers aren’t paying any attention to nature. Their eyes are straight ahead, looking for the next bump, gully, whatever, or they’re looking at each other. So I’m assuming the beauty of nature isn’t necessary for them to enjoy their rides. Places where they can kick up mud and bounce around with abandon would be good for them. Hi Sue, I was reading a blog last night that was most interesting. http://www.mellomikeswolfcreekcamper.blogspot.com The article under arizona boondocking regulation and gray water might interest you. Thanks, Barbara. I’ll look it up. Howdy rvsue, What did you find at Mello Mike’s site?? I didn’t find anything except generator talk!! I didn’t find what Barbara referred to. I clicked on the headings at the top. He talks about boondocking some. Howdy, I dug a little deeper, under older blogs and found it about 3-5 days earlier…It’s about like Bob Difley’s on the same subject… Bob is another guru of ‘Boondocking’… He writes books too, also!!! I wish he’d comment on this!!! Hey Sue – I know you keep up w/ ‘the outside’ world but JUST IN CASE you haven’t heard, there’s gonna be a BEAUTIFUL full SUPERmoon (what they’re calling it) tomorrow night. When I heard about it, I first thought of you and what a glorious sight it’ll be from where you are. ENJOY! and another thing – I can’t get on the Bayfield Bunch website. You mentioned them and they sound so interesting (like you) but I keep getting an error. Could you share the link again? It’s probably me, but just checking. Thanks ! must be me…….still get the error. I’ll keep trying…..
Don’t know if you’re still reading comments this far down, but… Whatever you do, DO NOT tell them you are living full-time in your rig. To them that means you are a squatter, so they can ticket you or even arrest you. Just say you are passing through; which is actually true. Remember that ignorance of the law will not help with a ranger intent on enforcing the rules. Take care! Thanks, Pleinguy! It’s nice of you to voice your concern and to share this advice. I didn’t realize fulltiming is sometimes considered a bad thing . . . shows how naive I am!